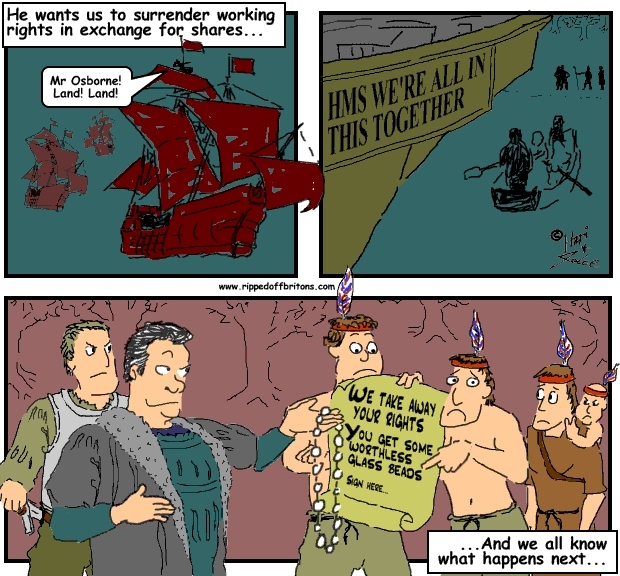 Outsourcing promises cost savings in a time of austerity. History shows these promises of efficiency and cost savings are false. But even if they aren't don't give up your rights in exchange for a handful of silver. Hold on to your rights. Rights are not given to you by the powerful through their benevolence. Rights are given only when the powerful need you to fight their wars, work in their companies, or vote for them in elections. Rights are given reluctantly, and are taken back when the opportunity arises. Such an opportunity was created by the banking crisis, smuggled in under the cloak of 'Austerity'. In the last two centuries the industrial revolution and worldwide wars made the powerful very dependent on ordinary people. Robber barons needed ordinary people in their armies and their factories just to stay ahead of other robber barons. Things are changing. Recent decades have brought automation of factories, computerisation of routine jobs, globalisation of the supply chain, and missiles and drones requiring very few to press the buttons that destroy very many. As time passes, the powerful need us less. When the powerful tell you they are taking away your rights for your own good, don’t trust them. Employment rights, the right to a fair trial judged by your peers, the right of habeas corpus, the right to a fair share of the nation’s wealth, the right to the protection of the law regardless of your ability to pay a lawyer, the right to a high standard of health and education, and many more hard won rights are being eroded. The powerful are using the opportunity brought by banking crisis austerity as cover. 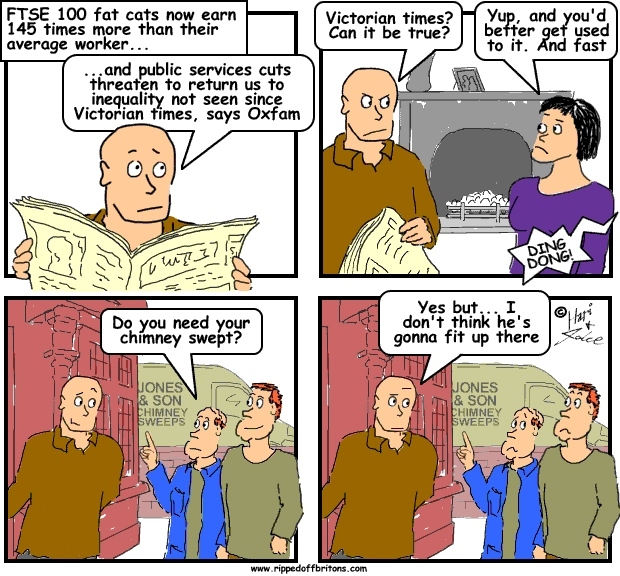 They tell us we are in a crisis so severe that we must cut costs by cutting benefits, pay, pensions, and services. But not severe enough that we can't still cut top rate income tax, cut corporation tax, and not severe enough that we need a wealth tax. Give the rich a bigger share and, in exchange for our rights they promise the rich will be generous to us. We don't trust in this bargain, but in the face of the powerful we feel powerless. Organisations ruthlessly pick their leaders for the benefit of the organisation. Companies select for profit, political parties select for power. But there are still ordinary people in the halls of the powerful. People the powerful in government strive to purge by 'outsourcing'. Public servants are perhaps the greatest protectors of our rights. Not the top mandarins, who have gone through the same ruthless selection process as company executives and cabinet ministers. It is the ones in the middle and bottom of public service that watch and witness our rights. 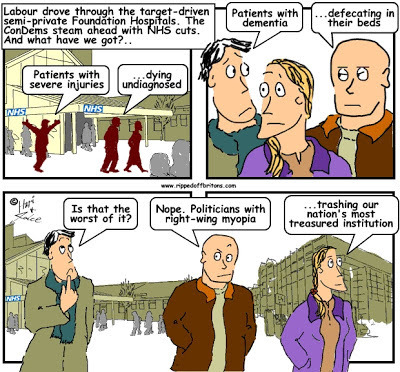 In hospitals it is those public servants doing long shifts wearing a doctor’s stethoscope, carrying a nurse’s bedpan, and pushing a cleaner's mop that are our protection. It is those public servants who stand at the interactive whiteboard in a school, who patrol our streets in a copper’s helmet, who march through foreign lands in camouflage. It is all those grey men and women pushing mice on civil service mouse-mats. 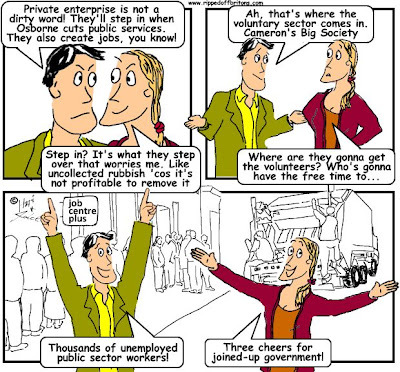 Ordinary public servants of all sorts who are, in short, just more of us ripped-off Britons. They aren't heroes any more than the rest of us are. But when the targets and tick boxes set by their bosses make them behave badly, they know it is people like themselves who suffer. They themselves have to endure what the powerful dictate. 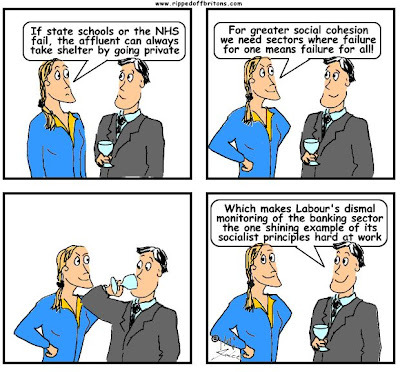 The powerful can buy private health and education, and have no need for benefits to supplement their pay. Sure, it is harder to fire a public servant and private sector labour flexibility can bring benefits. But this very inflexibility means a public servant is less in fear for his job, and more likely to 'blow a whistle'. And it is this fear of the whistle-blower that slows down the rate and ruthlessness of the powerful eroding our rights. Public services can be bumbling, inefficient and incompetent. It is said that a focused properly incentivised commercial organisation can do better. But ‘better’ for whom? Public services are monopolies. We don’t have two armies who compete to see how many foreigners they can quell per £. Hospitals, police forces, councils sweeping streets and collecting your bins, they are all virtual monopolies in their own local areas. When they are outsourced these monopolies are handed over as monopolies to organisations motivated by profit for the duration of their outsourcing contracts. And so with outsourcing we are still left with inefficient monopolies. Only now their inefficiency is not due to bumbling and incompetence but due to the pursuit of profit. They are even able to claim they are not inefficient. “Inefficiency” to us ripped-off Britons is poor service. “Inefficiency” to these private monopolies is poor profits. By their own measure the private companies are very efficient. They achieve this by providing the bare minimum service using the bare minimum resource. Minimum efficiency in service provision equals maximum efficiency in pocketing the difference in profits. And so the reduction in costs is not returned to us ripped-off Britons. There is no long term reduction in the price paid by Britons for the service. And a further price is paid by Britons in the degradation of the services that are our rights. The National Audit Office scrutinises public spending on behalf of Parliament, auditing the accounts of all central government departments and agencies, and many other public bodies. Local government has been audited by the Audit Commission that has had responsibility for appointing independent auditors. By this change in the law local government politicians busily outsourcing their functions will be free to appoint their own auditors. Auditors chosen and paid by the people they are supposed to audit and hold to account. For what reason? “More than a third of general practitioners on the boards of new clinical commissioning groups (CCGs) have a conflict of interest due to directorships or shares held in private companies, reveals a BMJ investigation today. It provides the clearest evidence to date of the conflicts many doctors will have to manage from April 1, when the GP-led groups are handed statutory responsibility for commissioning around £60bn of NHS healthcare. The BMJ used Freedom of Information requests and CCG websites to analyse the registered interests of almost 2,500 board members across 176 of the 211 commissioning groups in England. And who will be holding the GPs to account? 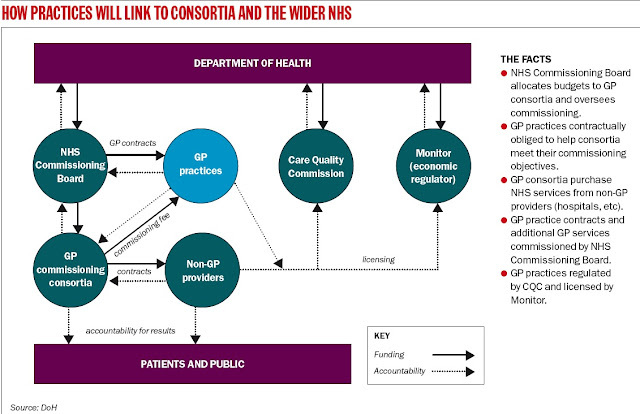 According to their graphic, the Department of Health will wash its hands of responsibility leaving "accountability for results" with the "Patients and Public". So it is up to us to hold the GPs to account! History is full of examples where a handful of silver is enough to dupe people into giving up a good thing. A handful of silver is quickly spent, and probably not on you. If the price of protecting your rights is inefficient public service, rather than outsourced "efficiency", then hold on to your rights. But outsourcing very rarely ever gives advantages. Often the same people are employed under a new level of management driven by profit rather than results. How could this ever result in real advantage.